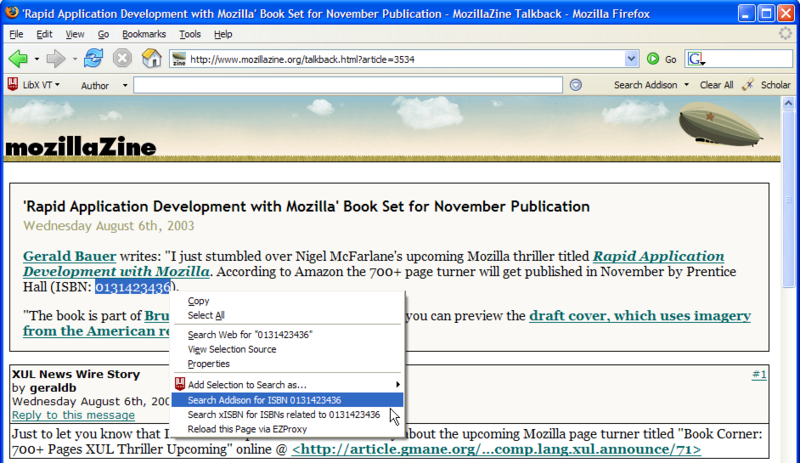 LibX is a browser plugin for Firefox and Internet Explorer that provides direct access to your library's resources. LibX is an open source framework from which editions for specific libraries can be built. Currently, 816 academic and public libraries have created public LibX editions. The LibX edition builder allows you to quickly set up and customize your LibX edition. It uses auto-detection technology to "guess" your local library catalog, and it uses OCLC registries (e.g., the Worldcat registry and the OpenURL resolver registry) to find those resources. A community-shared database keeps track of resources other users have set up. Direct access to the catalog via a toolbar and context (right-click) menu - automatic construction of simple or advanced searches. Search by entering terms, select and right-click, or select and drag-and-drop without having to navigate to the library catalog page. LibX supports Millennium, Voyager, Aleph, Sirsi, Dynix/IPAC, Serials Solutions E-Journals and Central Search, SFX, Sirsi Web2, and user-defined catalogs. You can define catalogs for any web resource. The context menu changes automatically depending on what is selected. For instance, if an ISBN is selected, the context menu will offer the option to search directly using that specific identifier. Currently recognized are CrossRef DOIs, ISBNs, and ISSNs, and PubMed IDs. Your users can fully configure which options appear. OpenURL is a standard that helps your library get you to appropriate resources, including the full text of journals to which it subscribes. LibX gives direct access to your institution's OpenURL resolver, which can directly point you at the full text of an article you are looking for. (OpenURL resolvers are often called "Find it@", "Article Finder", "Article Linker", "WebBridge", "Get it@", "Find Fulltext", "Article Express" or similar names.) OpenURL can work well in connection with Google Scholar. Select text and search for the selected text on Google Scholar. In addition, LibX will read Scholar's results for you, determine whether the paper was found and if so, ask the OpenURL resolver for a paid-for copy, should you not have access to the copy to which Scholar links. You can use this feature even from inside a PDF, which makes retrieving papers referenced in a PDF file a snap. LibX places localized cues in web pages you visit if the library has resources related to that page. Whenever you see the cue, click on the link to look at what the library has to offer. For instance, book pages at Amazon or Barnes & Noble contain cues that can check whether the library has the book you are looking to buy. Other pages that contain cues are Google, Yahoo! Search, the NY Times Book Review, and many others. See the LibX screencasts in Demo 3 for examples of this feature. Based on Jesse Ruderman's autolinking script, LibX automatically links ISBNs, ISSNs, DOIs, and other identifiers to the catalog or OpenURL resolver. Support for off-campus access to licensed resources, if your institution uses EZ Proxy or III's WAM. You may reload a page through the proxy, or follow a link via the proxy, making it appear as though you are coming from an on-campus computer. This features gives you access to resources to which only on-campus users have access. You can set up EZProxy such that LibX will automatically detect if a page can be proxied. LibX supports COinS, which can turn hidden tags inserted by web site authors or publishers into actionable OpenURLs links that allow a user to download the full text of an item. Examples of COins implementations: Wikipedia, Open WorldCat, Citebase. Support for OCLC's xISBN: find a book, given an ISBN, even if the library holds this book under a different ISBN. For instance, autolinked ISBNs such as this one 006073132X use xISBN's metadata service to retrieve the book title and author and display it in a tooltip. A hotkey (F9 or Ctrl-F6) can be used to quickly show and hide the toolbar if it is not needed. LibX was created by Annette Bailey and Godmar Back.